Seven years ago, I worked for a start-up production company that produced short, documentary-style videos for organizations to show at international conferences. 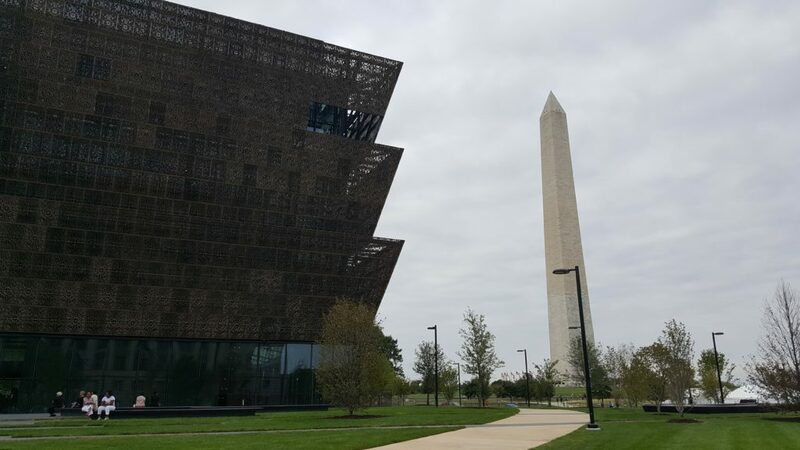 One of my clients was the yet-to-be-built Smithsonian National Museum of African American History and Culture. I was assigned to collect all of the video that our field producer gathered and put it into a 5-minute story on the new museum, which was still 7 years away from being built. 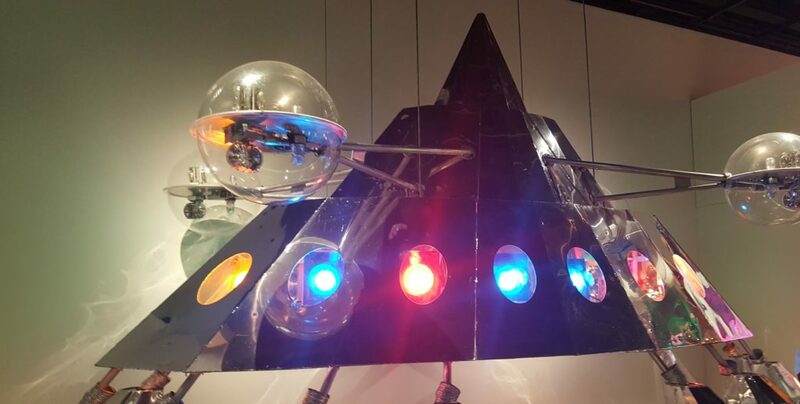 There was so much to talk about and so many great items that were coming together for the museum’s collection that the video could have been 15 minutes long, or more. 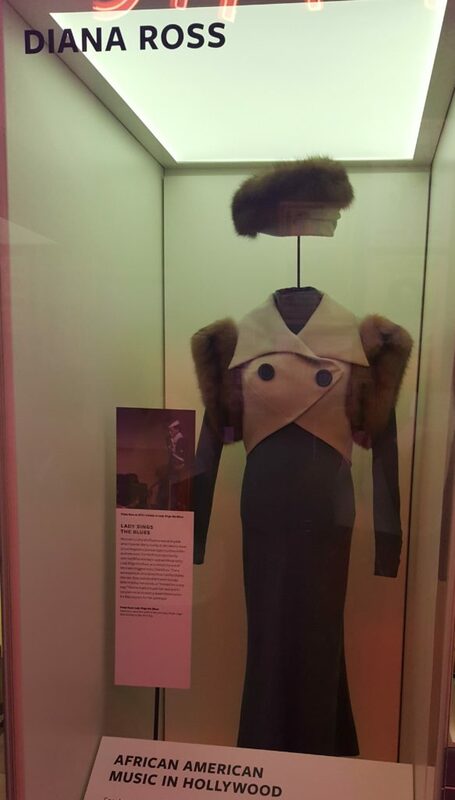 In the end, working with the museum’s staff, we decided to just tell its story and focus on some of the items that would be in the collection. 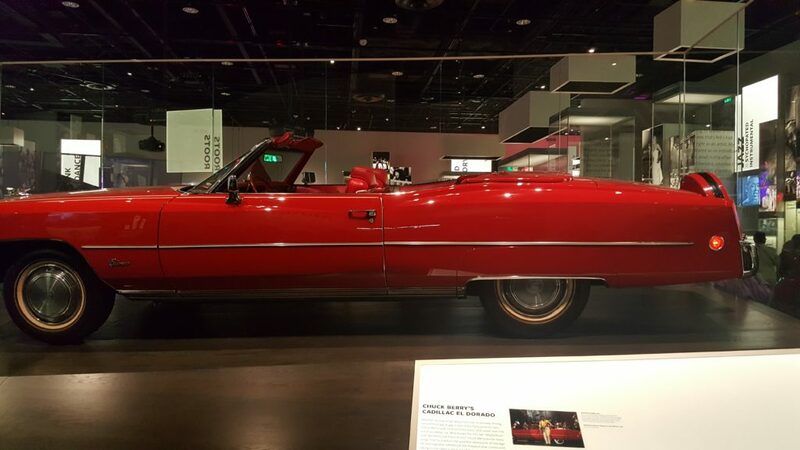 Fast-forward to 2016 and the museum is finally here! The regal structure is made to look like the intricate iron work created by slaves in Charleston and New Orleans. The building sits adjacent to the Washington Monument on the National Mall. 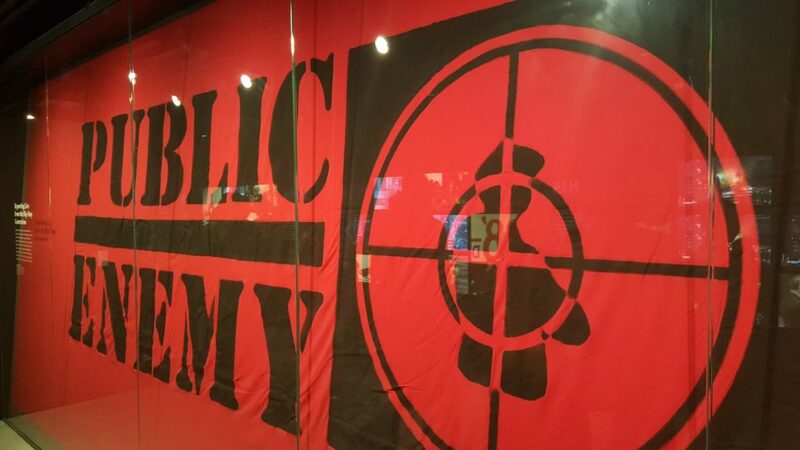 As a charter member, I got the chance to take a peek inside today, one week before it’s set to open. 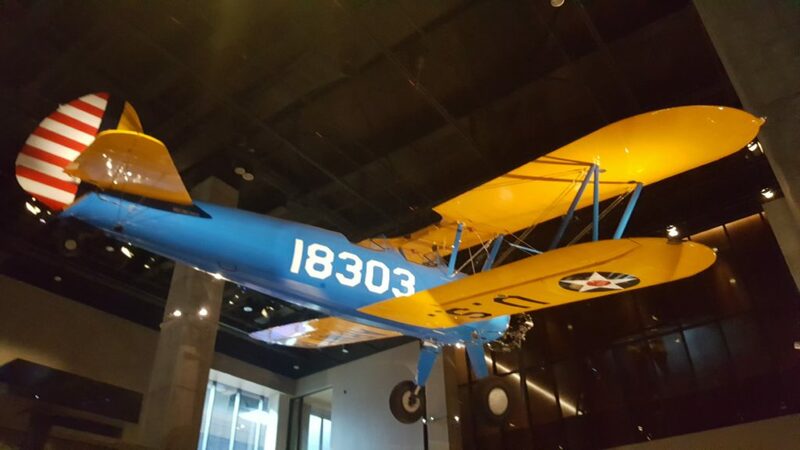 I snapped a few images of what’s inside to give you a taste of the new museum’s greatness and I’ve got a few tips to help you navigate it all. When you enter, do what the volunteers say and start from the bottom! 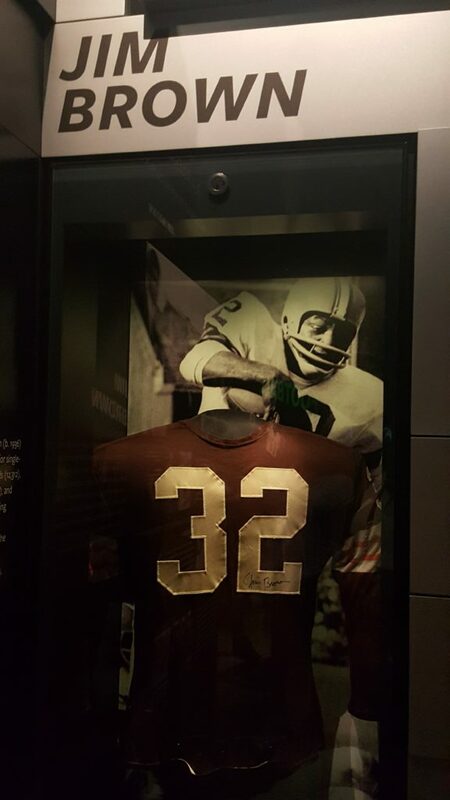 From the street, you’ll enter on the Heritage Hall level. Do yourself a favor and just take the elevator down to C3 where the “Slavery and Freedom: 1400-1877” exhibit is. That way you won’t spoil things by catching a glimpse of those middle floors. 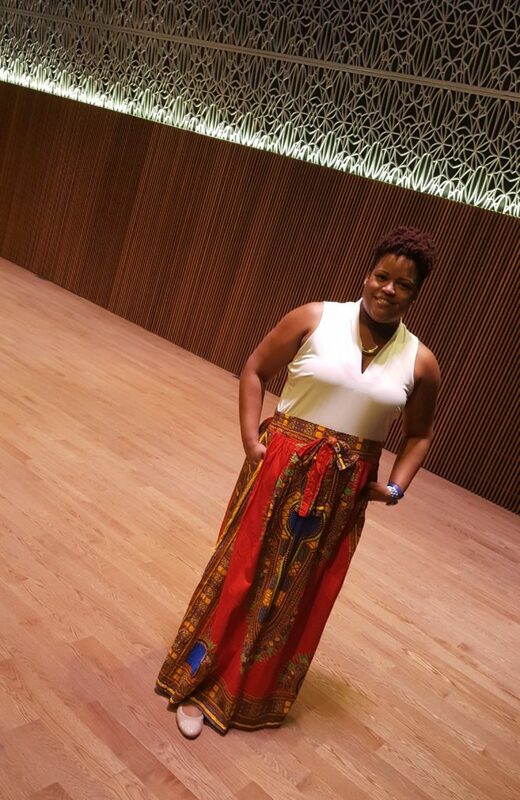 As soon as I walked onto the “slavery” floor, I noticed how quiet things were. 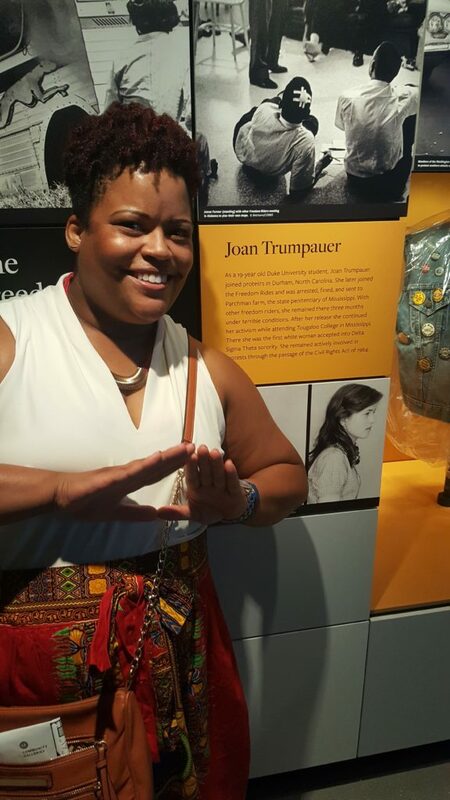 The feelings of reverence and respect are palpable as visitors made their way through the transatlantic slave trade, slave economy, a slave cabin and on through to the Civil War and emancipation. The museum is still under construction in some areas as the Smithsonian prepares to open to the public on September 24, so some sections were closed or unfinished. The room housing the São José slave ship wasn’t quite ready yet, but there was still a lot to see. 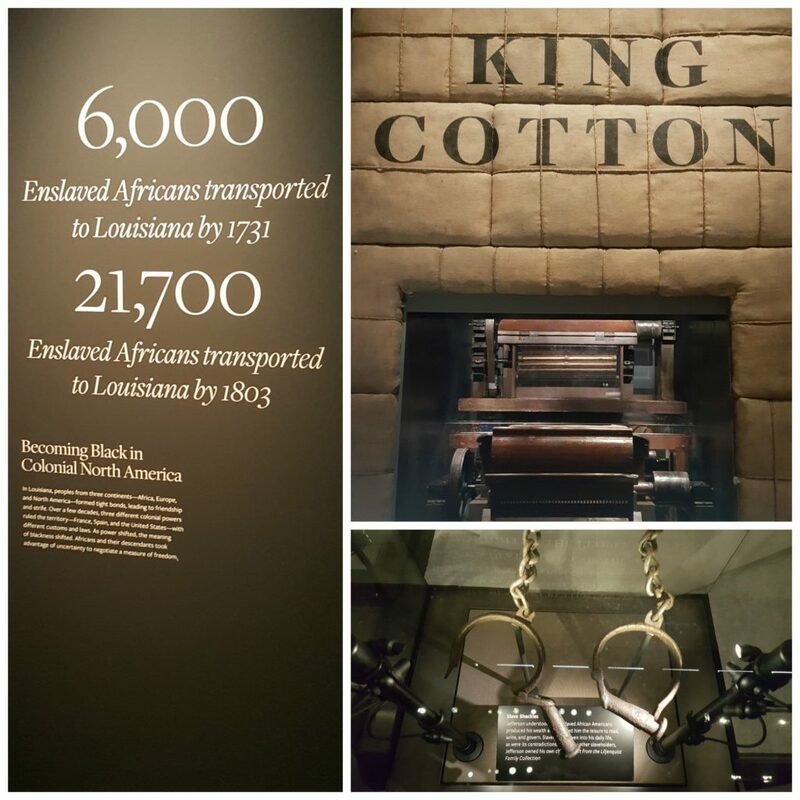 (Clockwise from top right) Collage of cotton gin, slave shackles and facts about slavery. 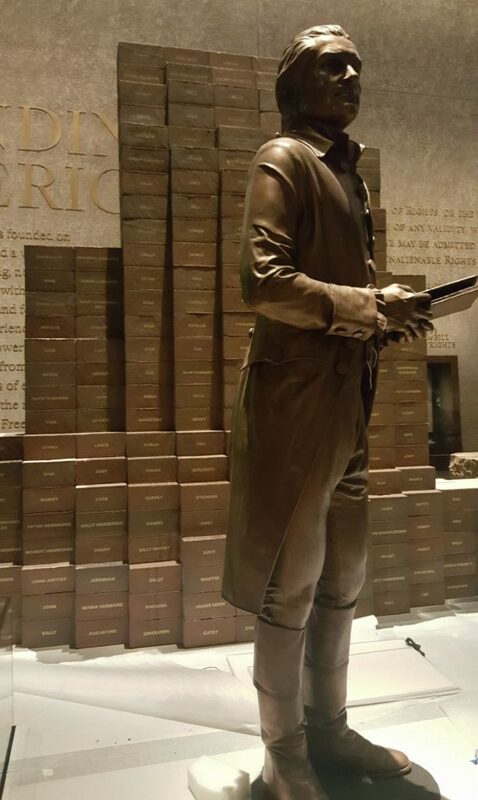 Thomas Jefferson stands in front of a wall dedicated to the Declaration of Independence while each brick behind him represents his slaves. 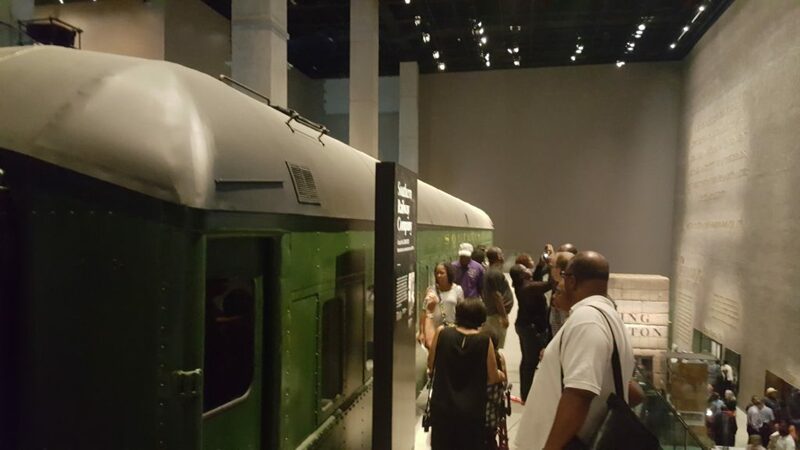 From there, level C2 displays the “Era of Segregation 1876-1968.” This floor features a segregated rail car, a freedman’s home, an interactive lunch counter and the first glimpse of an entire Tuskegee Airmen’s plane. 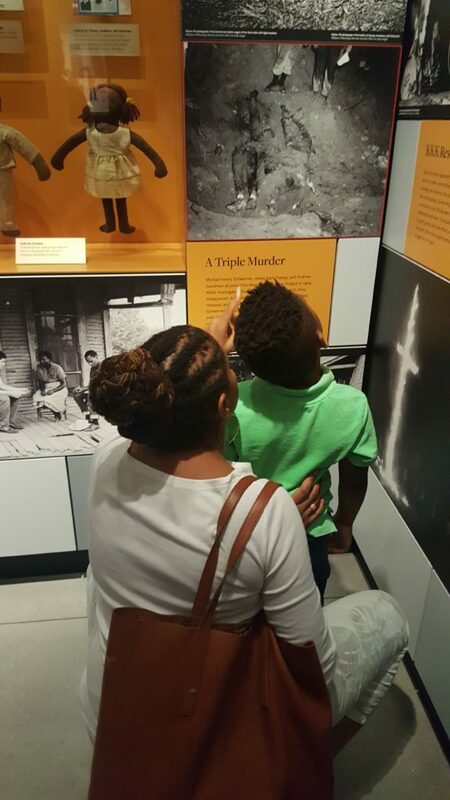 A mom teaching her young son about Chaney, Goodman, and Schwerner — Mississippi civil rights workers who were murdered. 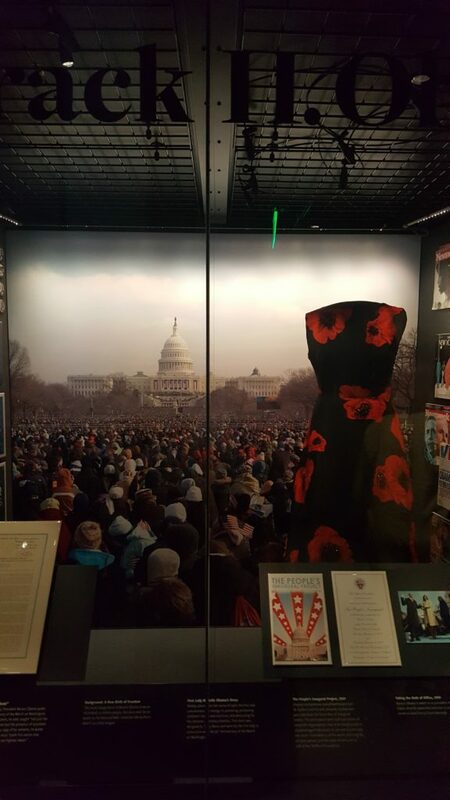 A projector displays images above the “Defending Freedom, Defining Freedom” exhibits. A segregated rail car bridges the gap between the “Era of Segregation” level and the late ’60s. 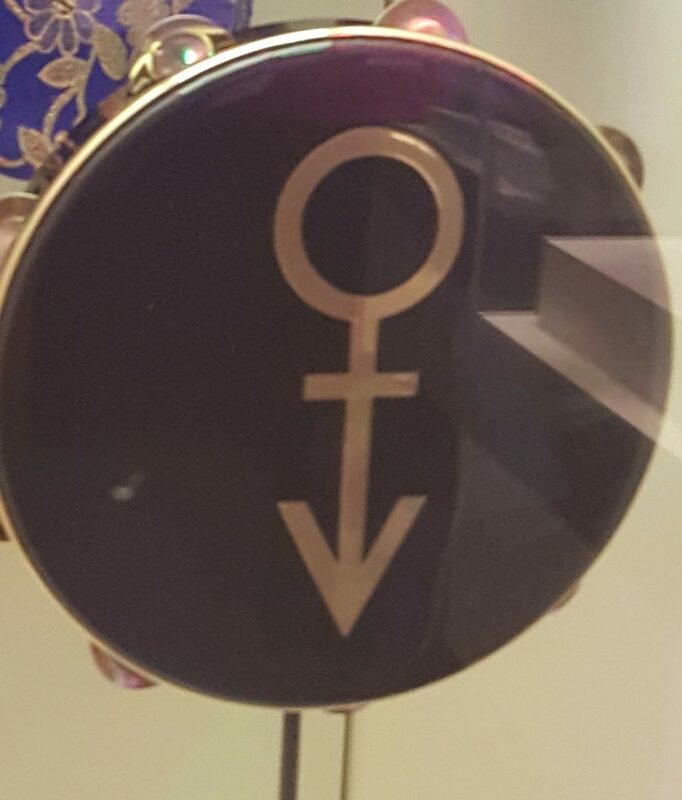 A symbol of the era. 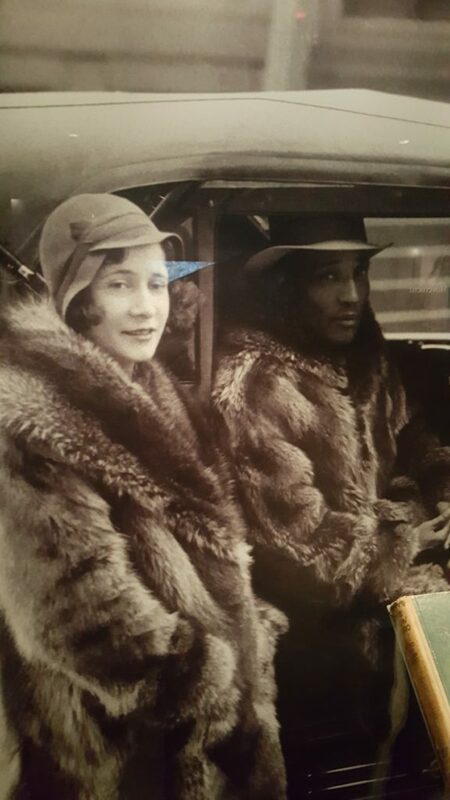 After the Great Migration from the South, this Harlem couple is out for a ride in their Sunday best. I’ve decided these are my people! 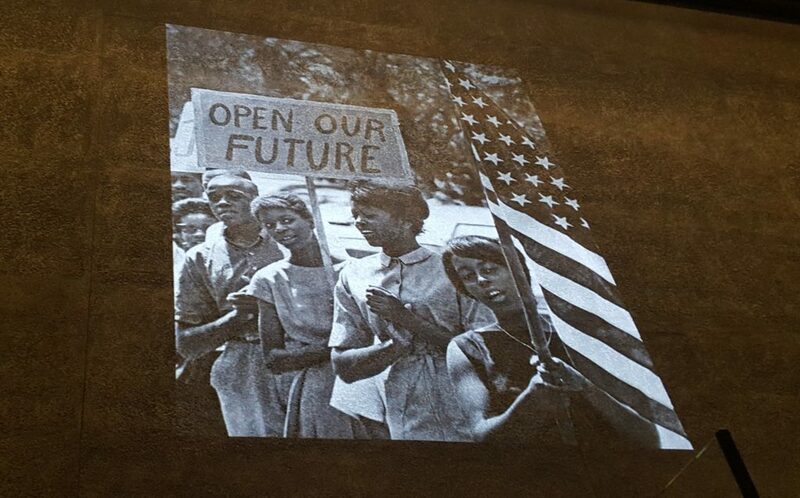 The next floor reveals the changes in America during from 1968 and beyond. 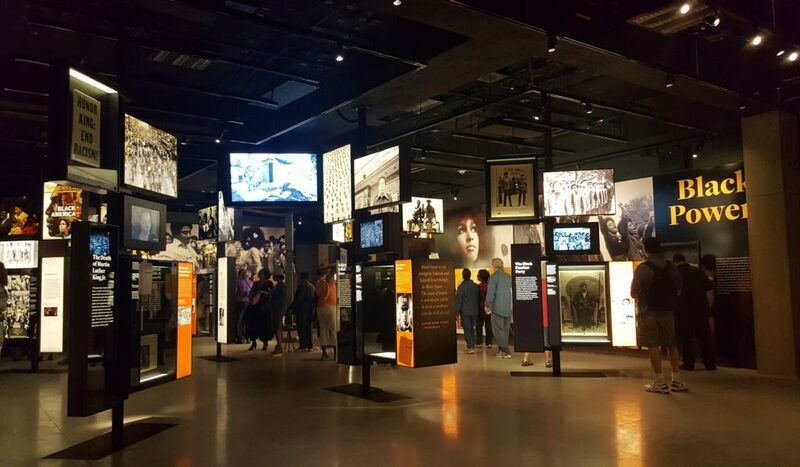 On level C1, you’ll find how this era impacted the cities and suburbs, learn about the many freedom fighters (black and white), and see the impacts of the various marches of that era. 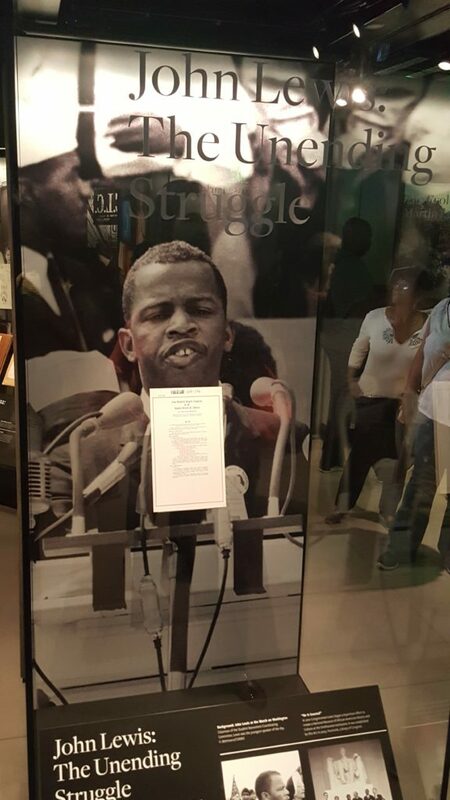 The section dedicated to Freedom Rider, now Congressman John Lewis. No stone is left unturned. 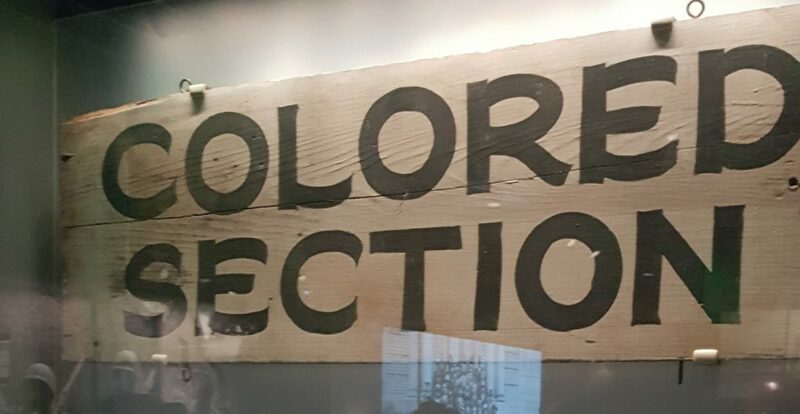 White contributions to the struggle for civil rights are included in the museum’s exhibits. 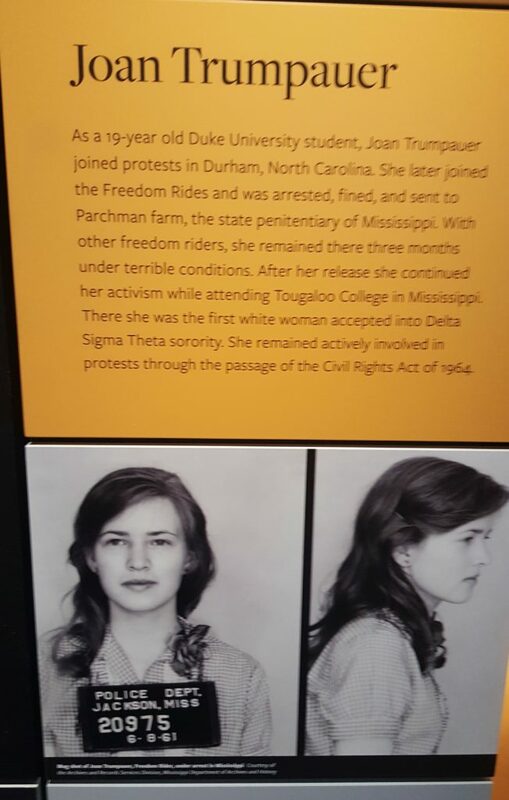 Here is Joan Trumpauer Mulholland, an American civil rights activist and a Freedom Rider. 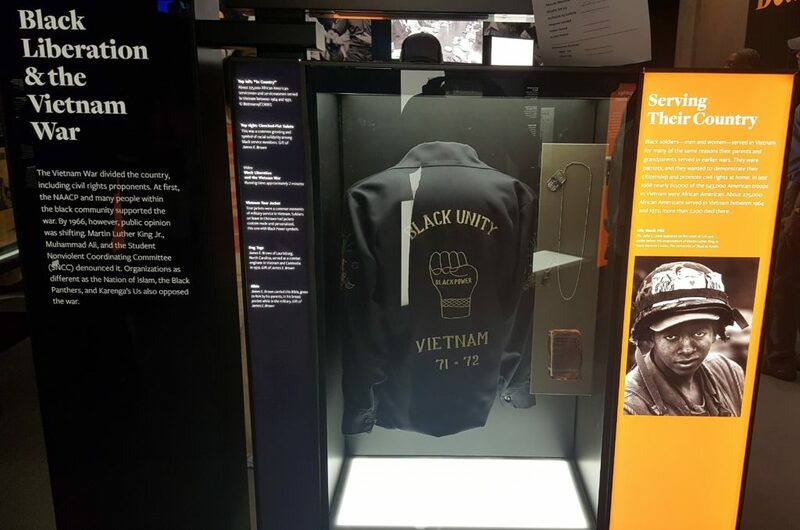 What’s that about folks questioning black patriotism again??? 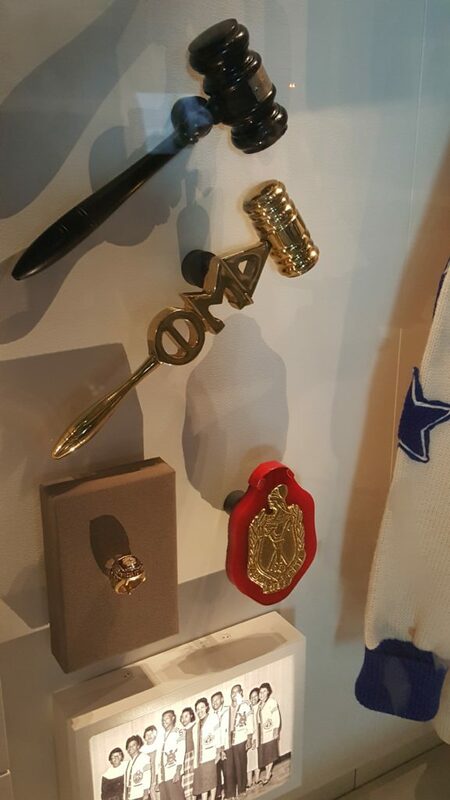 This section of the museum culminates with the inauguration of President Barack Obama. 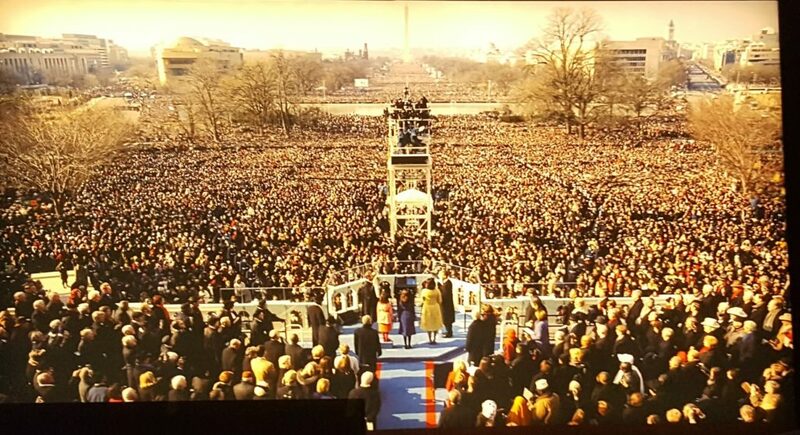 More of President Obama’s inauguration. 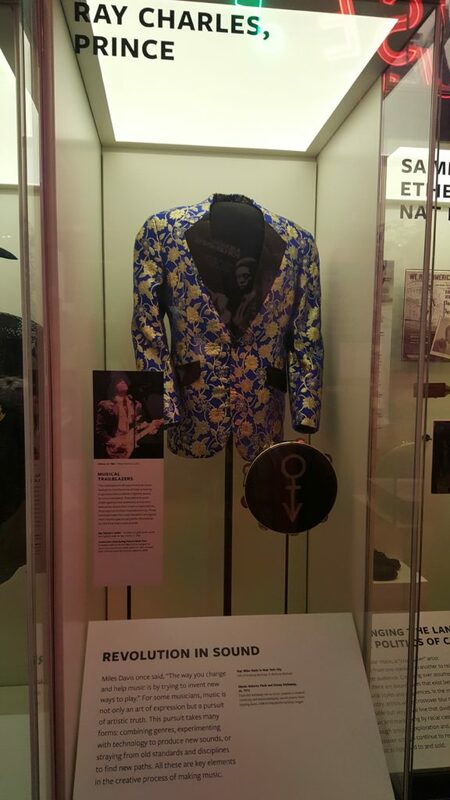 The Black Power and Pop Culture exhibit. 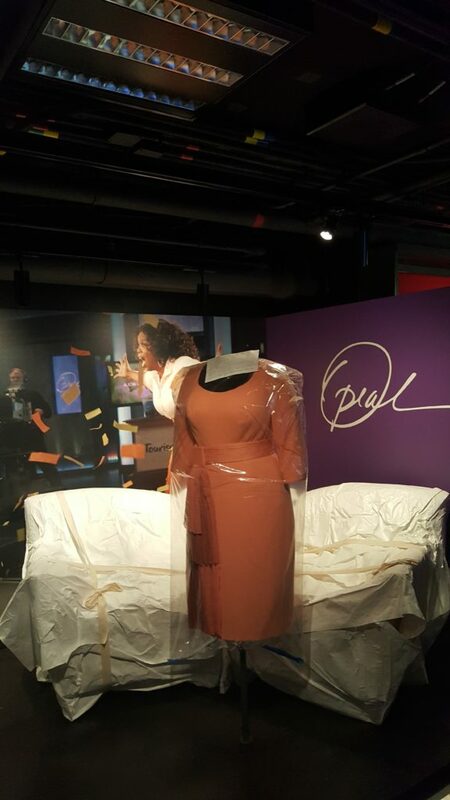 Oprah Winfrey’s dress from her final show and chairs from her set, still wrapped for safe-keeping. After this level, you’re back at the concourse and then it’s on to the upper floors. There’s a certain lightness and joy on these floors as our contributions to food, art, music, sports, public service through fraternal organizations, and culture are highlighted and celebrated. There are three more floors above the Heritage Hall level that showcase community and culture galleries. 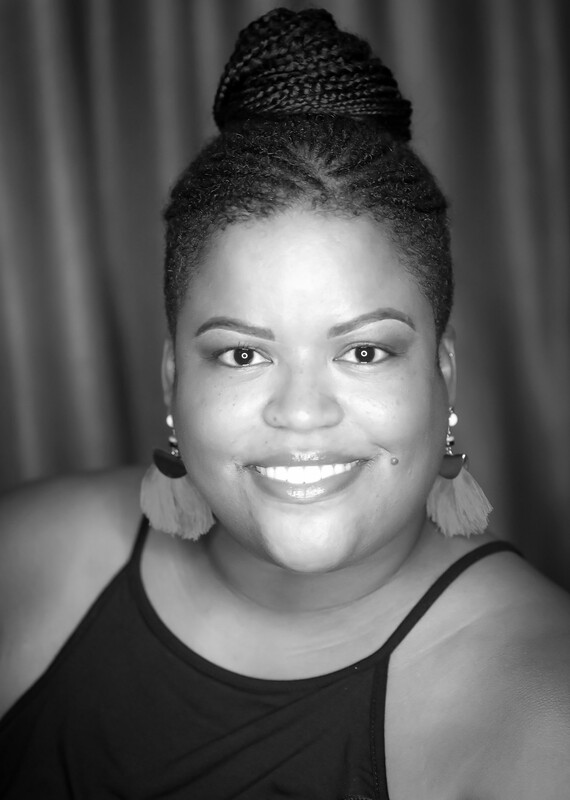 You’ll see how blacks across the Diaspora have influenced how the world cooks, what hairstyles we wear, the clothes we love and the music we adore. 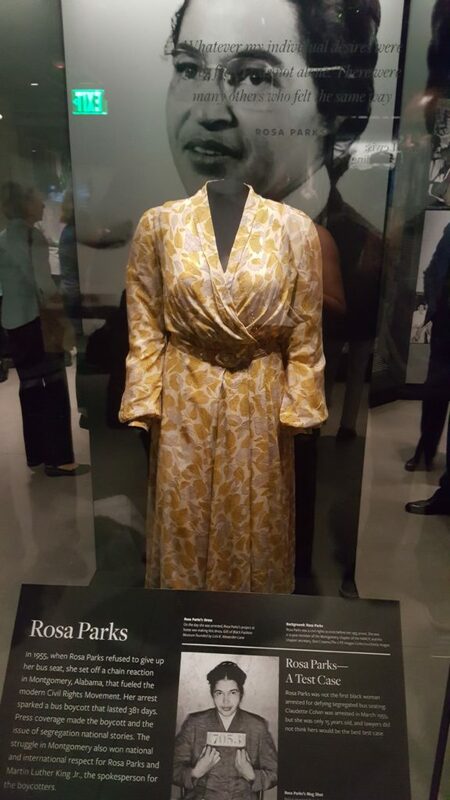 Who ever would have thought a “Real Housewife” would be in a Smithsonian? But, it fits perfectly with the sentiment of this cultural contributions exhibit. 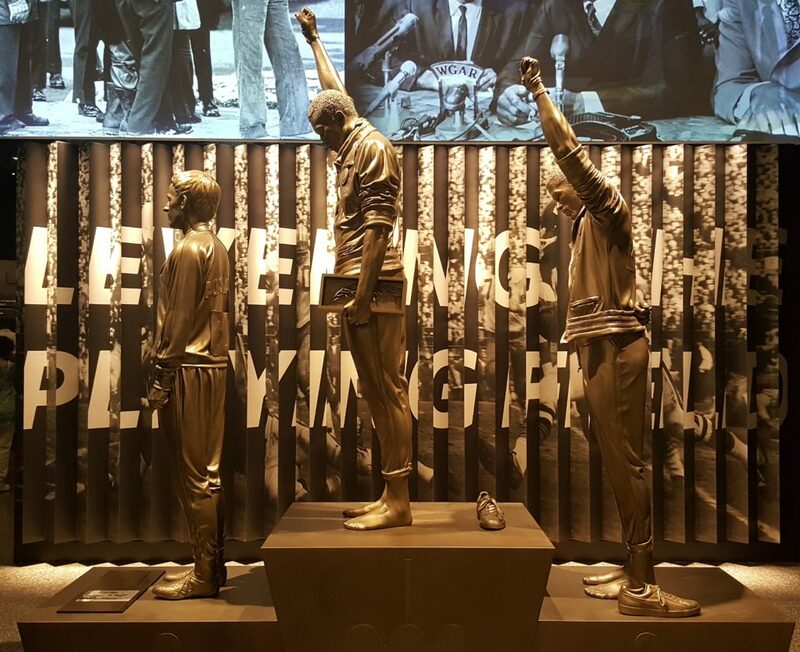 A statue of gold medalist Tommie Smith and bronze medalist John Carlos raising their fists in Black Power salute during the 1968 Summer Olympics in Mexico City. One of the NFL’s finest. 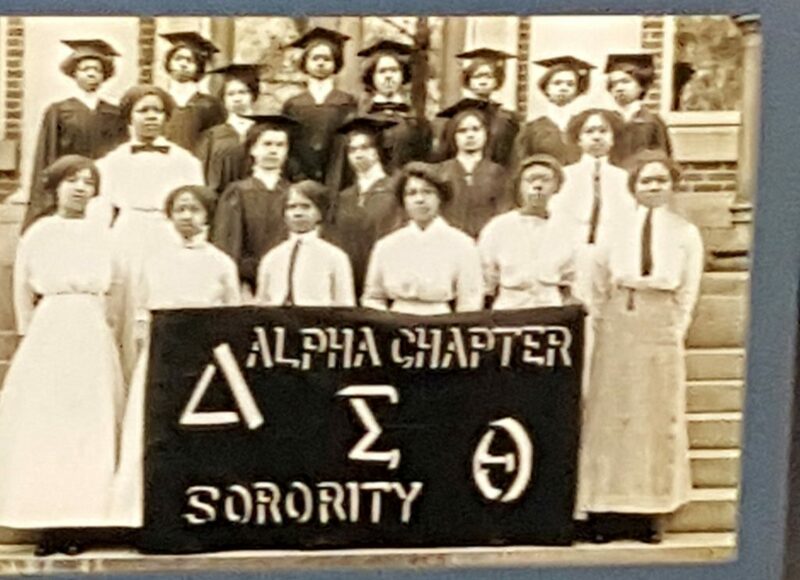 Delta Sigma Theta artifacts in the exhibit highlighting the birth of black Greek-lettered organizations. There is so much more incredible stuff to see that I couldn’t possibly capture. There were sections and one whole floor that weren’t open yet. The museum’s Sweet Home Cafe was also closed but I hear it’s going to serve quite the spread. There’s also a gift shop and an outdoor reflecting area which were still under construction. If you want to go, you’ll need to reserve a free timed entry pass. The next available dates are in November, though I hear that same day tickets may soon be available. Visit the museum’s online ticket site for timed entry passes. 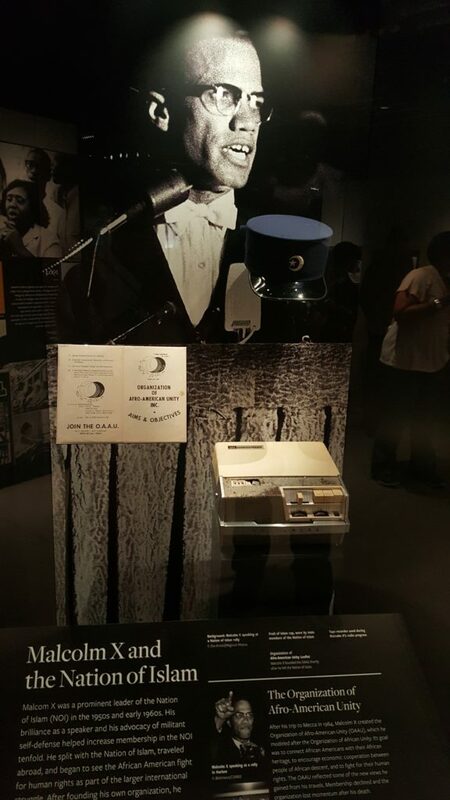 The African American museum is a definite “must see” for ALL people, but most especially us! Are you going? Have you been already? Drop a comment below and let me know what you want to see or what you thought of the new museum.